Acer trying to capitalize on... Olympic fever? We've seen plenty of branded devices before, but most of them have either a logical connection, or are branded with something that you can't really say no to. For example, last year's Google I/O had a specially branded white Samsung Galaxy Tab 10.1 for the attendees, and of course no one can forget the Motorola DROID R2-D2. This is one branding that seems a bit strange to us. 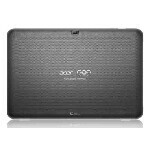 Acer has decided that it would be a good idea to release versions of the Iconia Tab A510 and A700 branded for the Olympic Games. Not even specifically the London Olympics which will be in just a few months, but the Olympics in general. Both tablets haven't even hit the market in their regular edition variants, but are expected to be released sometime this month. The Olympics are certainly big business, but we don't really see the connection between it and Android tablets. Both tablets are expected to be running Android 4.x with 1.3 GHz Tegra 3 processors, 5 MP cameras and 10" screens. The only difference between the two are the resolution where the A510 has a 1280x800 resolution and the A700 has a 1920x1200 resolution screen. And, as far as the Olympic branding, the only thing you're getting there is a simple small set of grey Olympic rings screen-printed on the back and the choice of black or silver. Otherwise, there's no real indication that anything else is different, although Acer has said that in addition to these tablets, Acer will have other devices branded for the Olympics which will all be "specifically designed for the Olympic Games in London." When Balance Sheet speaks companies need to do something. Acer said last time that they are tired making cheap products. Dell said netbooks are pointless, Ultrabooks is the future. Since the emergence of tablets and smartphone, notebook manufacturers have seriously been intimidated. Perhaps in the U.S they need to innovate and move on. However here in Asia, Notebooks, netbooks are hot selling products. Netbooks are becoming increasingly popular and the only company that seem to deliver is Asus with its EEe PC. So clearly some manufacturers need to review their strategies.